The Army engineers are working on a new supergun with a 1,000-mile range that could potentially hit targets in the South China Sea from a gun pit on land, Army Secretary Mark Esper told reporters on Wednesday. The tests with extra long-range artillery are part of the Army’s new look at hypersonic technology, which the U.S. military originally decided not to weaponize years ago. The main conclusion which is now behind this new experiments is it that the U.S. Military needs to outrange enemy guns. “You want to be outside the range that they can hit you,” Esper said for Task & Purpose. Sig Sauer Lightweight Machine Gun to replace SOCOM’s M240 SAW? The Army claims its new assault rifle will unleash a hailstorm of specially-designed shells with as much chamber pressure as a battle tank to tear through even the most advanced body armor — and if all goes according to plan, the soldiers will get them to play with sooner than they thought. The service plans on fielding a Next Generation Squad Automatic Rifle (NGSAR) — the first version in the Army’s Next-Generation Weapons System that chambers a round between 6.5mm and 6.8mm — as a potential replacement for its 80,000 M249 SAWs starting in fiscal 2022 rather than the original target date of fiscal 2025, Col. Geoffrey A. Norman, force development division chief at Army HQ, told Task & Purpose, with two per nine-man infantry squad. 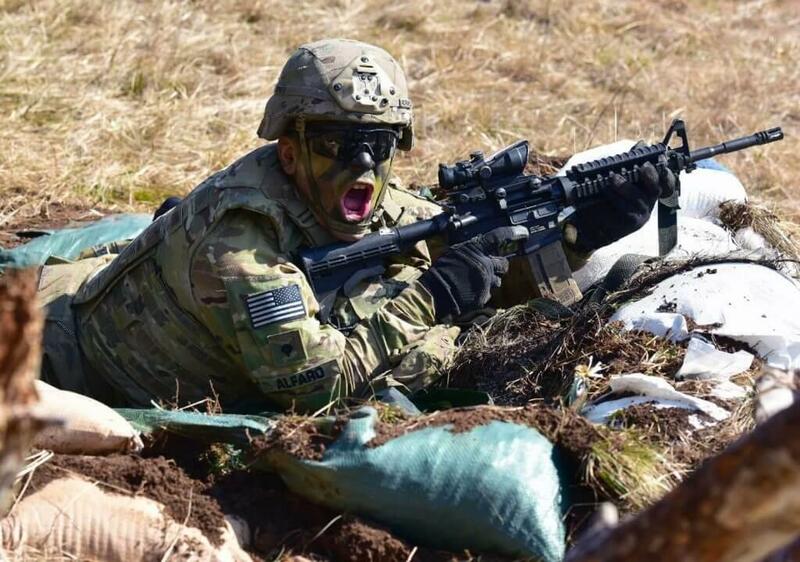 While the service still hasn’t set official requirements for the system, the NGSAR will weigh less, shoot farther, and pack more punch than the service’s existing infantry weapons, Norman told Task & Purpose. And more importantly, the platform will incorporate a chamber pressure superior to the current system in soldiers’ arsenals to ensure that the rounds can still blast through enhanced enemy body armor at up to 600 meters. The NGSW program currently consists of the NGSAR, a Next Generation Squad Carbine (NGSC), and a squad designated marksman rifle, along with specialized ammunition and fire control system. But while the Army had previously focused on fielding an improved carbine with a range and accuracy superior to the standard M4 that would also chamber a round between 6.5mm and 6.8mm, the service recently changed gears to prioritize the muscular automatic NGSAR. The service is certainly working overtime to get the muscular system turning militants into pink mist downrange. Gordon told Task & Purpose that the NGSW systems currently undergoing testing and evaluation by the Soldier Lethality Cross-Functional Team at Fort Benning, Georgia will initially head downrange with the 7.62mm XM11158 Advanced Armor Piercing (ADVAP) round while the service hacks away at a specialized round built to achieve the proper balance between range and lethality. The Army’s hard target of a 2022 fielding may seem ambitious, especially given the maddeningly batshit nature of defense acquisition. But the service isn’t the only one putting the NGSW in the crosshairs: According to Gordon, the Corps is also interested in adopting the NGSAR alongside the M27 and M1101 CSASS sniper rifle the Army has eyed in recent years. And with the campaign against ISIS in close-quarters environs like Iraq and Syria winding down, soldiers and infantry Marines could use the range and the punch of the system sooner rather than later. Jared Keller is a senior editor at Task & Purpose and contributing editor at Pacific Standard. Follow Jared Keller on Twitter @JaredBKeller. The assault rifle, unveiled in 2017 and displayed at Russia’s “Army 2018” defense expo, will be limited to close-quarters FSB use and is expected to see action in future Russian counter-terrorist operations. Russian Special Forces are getting the latest variant of the ASh-12,7×55 mm heavy assault rifle. Whereas Kalashnikov’s AK flagships like the recent AK-12 are general purpose military assault rifles that have to balance penetration, handling, weight, accuracy and shot distance, the ShAK-12 is designed for a specific use-case where weight and shot distance are largely irrelevant. Drawing on the experience of the Beslan school siege and Moscow theater hostage crisis in the early 2000’s, the FSB saw the need for a more efficient close-quarters combat weapon in hostage situations. Adrenaline and certain substances can suppress the immediate impact of gunshot wounds, potentially giving the target a short-term window of action before going down. In urban conflict scenarios, these minutes or even seconds can make a difference of several dead hostages. The ShAK-12’s 12,7х55 mm rounds are meant to solve this problem by instantly neutralizing targets upon contact, thereby avoiding prolonged gunfights. These 33-gram rounds can reportedly neutralize targets even with grazing shots and through walls. The ShAK-12 has an effective range of up to 100 meters, quite low for conventional military use but sufficient for close-quarters combat. Given ShAK-12’s intended operating scenario, a low effective range can be seen as a design feature in that it further minimizes collateral damage against civilians. ShAK-12’s three bullet types further highlight the manufacturer’s focus on tactical versatility: armor-piercing rounds with extreme stopping power to penetrate bullet proof vests and cover; subsonic velocity rounds for effective silencer fire; and light aluminium rounds that maximize stopping power while negating ricochet effects. To accommodate three 12,7х55 variants of different kinetic energy and pressure levels, the manufacturer opted for a short-barrel bullpup design. While a relatively rare form factor for assault rifles, it may offer better handling in close-quarters environments. The manufacturers attempted to compensate for the prodigious weight of ShAK-12’s 12,7х55 mm rounds by designing parts of the gun—like the magazine—with plastic and hybrid aluminium. As with many Bullpup variants, it uses a polymer stock. The ShAK-12 still weighs 5.2 kg (for comparison, the AK-12 is 3.3 kg), which makes it too heavy to issue for prolonged deployments in mobile operational theaters. The assault rifle, unveiled in 2017 and displayed at Russia’s “Army 2018” defense expo, will be limited to close-quarters FSB use and is expected to see action in future Russian counter-terrorist operations. Russia does, however, have a different set of plans for the ShAK-12 beyond its borders: ShaK-12 was shown at Defexpo 2018 in India and China and is being aggressively marketed as an export product.